Polymer clay is one of those hobbies that I never leave. Though I don't get into my stash of clay and tools and stamps as often as I would like, I do go back again and again. When I saw mini rayguns made from wood, I knew there would be a way to use polymer clay to fashion some tiny blasters. By tiny, I mean necklace sized. This tutorial is for 2" or so rayguns, if you want to go bigger, you should start with a foil armature. But for now, think small! 1. Look around the interwebs for general raygun structure and sketch out some ideas. I was fancy and put mine on post-its (I keep forgetting to use my sketchbook). Think about what colors you want your raygun to be too. If you want to get crazy, you can color your sketch too. The tiny raygun is going to be necklace sized, so don't make it too big. 2. 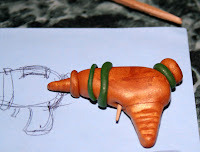 Take a small amount of polymer clay, about one third of the block of clay for the body of the raygun and condition it. Do this by working it with your hands until it is softer and more pliable. (If you have a polymer clay pasta machine, it's perfect for conditioning). If you want to paint your raygun post baking, then you can use whatever color clay you wish. But it's easier just to build it out of the right color polymer clay. It comes in all colors of the rainbow. I wanted my raygun to be bronze-gold with some green, so I went ahead and used those colors. When the clay is pliable, start sculpting. To get the general shape, I rolled the clay into a sphere with the palms of my hands and then tapered it by rolling just one half back and forth with my palms. You might see that you have too much clay at this point, just take it away and start over with a ball. 3. 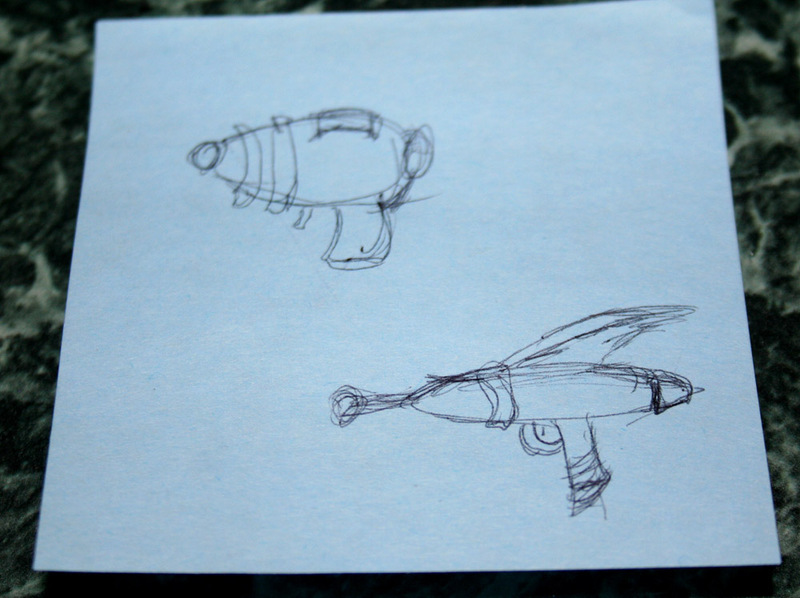 Once you are happy with the general shape of the body of the raygun, you'll need a handle. Take a very small amount of clay and make a small log. Smoosh (very technical term) this into a sort of rectangle. I had to play around a while before I was happy with the shape. Gently, but firmly, press the top of the handle to the bottom of the raygun. 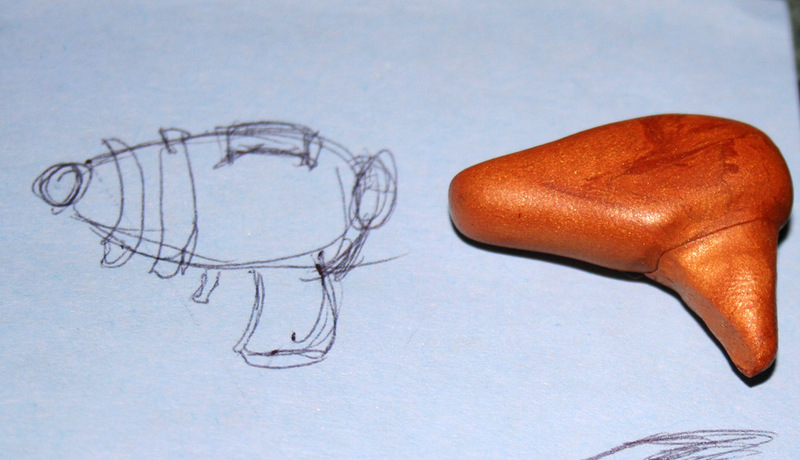 Using your finger or a clay shaper, blend the edges of the handle into the body of the raygun. Remember, polymer clay should be pretty easy to move about. If it's not, it needs more conditioning. 4. The general shape should be done now, time to embellish. I decided to take an easy route for the trigger and use the tip of a toothpick. I scored the toothpick with my Exacto blade first and then broke off about 1/4". I inserted that in the bottom of the raygun, close to the handle. 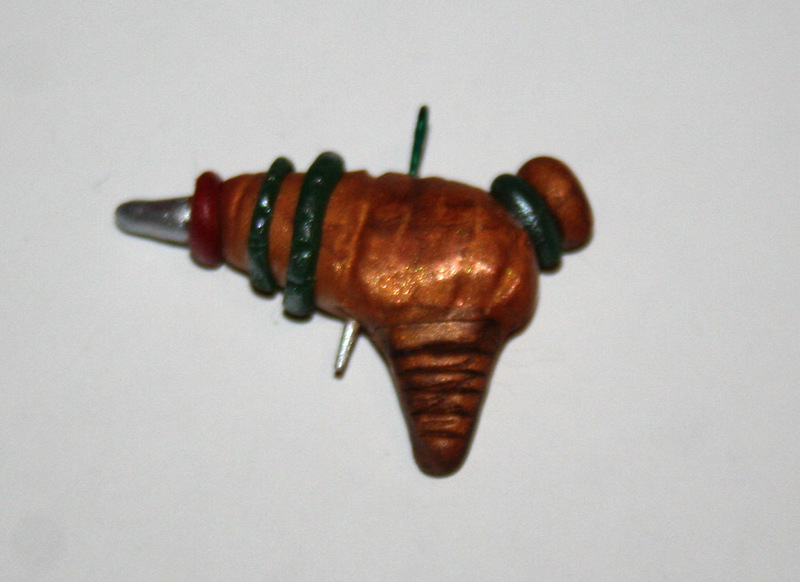 I also used another 1/2" of toothpick to add on the front of the raygun. I then covered it with polymer clay. To make the green pieces on the front, I used a very small amount of green clay and rolled thin logs out on a flat surface. Just carefully place them on the raygun and press lightly. Baking will secure the pieces, but if you want extra security, you can use Translucent Liquid Sculpey as glue (I didn't, but it's not a bad idea). The pieces on the back of the raygun are slightly flattened balls of clay. Finally, I used my Exacto knife to press lines into the handle. It will add some nice depth when we paint it. 5. Preheat your oven and then bake your piece according to the instructions on the polymer clay package. After the time is up, let it cool thoroughly. 6. While your raygun is cooling, get your paints ready. You'll need a couple of brushes made for small detail work. Put about 1/2 tablespoon of rubbing alcohol in a small cup. First, you'll use an alcohol wash on the handle to add some tonal variation. Add a small amount of dark brown paint to your palette (or in my case, Star Wars plate). If you are using matte medium, add an amount equal to the paint and mix them together. Load your paintbrush with paint and mix it thoroughly into your cup of alcohol. Tada, you've made an alcohol wash! Paint a thin coat of this onto the handle portion. It should sink right into the lines you cut in. Hold the raygun at arm's length from the hairdryer and blow dry. Repeat two more times. It's best to build up layers slowly. I also applied this technique to the gold smooshed ball on the top. 7. To add more variation, let's add silver to the green parts of the raygun. This paint was added using a dry brush technique. Add a tiny amount of silver paint to your palette and put a little on your brush. Paint on a paper towel or scrap paper until you can barely see any paint come from the brush. Then barely brush the tip of the brush on the green parts of the raygun to get silver highlights. 8. Paint the trigger and the point of the raygun silver. Then paint the last ring red. If you'd like, you can use a gloss medium on various parts for additional variation. 9. After your raygun has dried, thread the eyepin into a jump ring (how to open a jump ring) and put on the necklace cord. It's the Geeky Pumpkin, Charlie Brown!